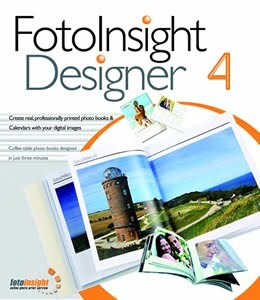 FotoInsight announces new "Designer v.4.6" Photo Book Software at Photokina. Every other year in September representatives from the world of photography come together at Photokina in Cologne, for the world's most important photographic fair. The leading players in the imaging industry's fastest growing segment - photo books - are getting ready to showcase their latest developments. FotoInsight announces a major upgrade to its "Designer" software for CEWE PHOTO BOOKS. Cologne, 21/09/2010. - To provide space where the favourite photographs can shine, photo book services like FotoInsight are constantly improving their software and their range. The latest FotoInsight Designer software upgrade incorporates many suggestions from a SirValuse Usability study and features apart from an enhanced navigation many new tools. Until recently, when designing a CEWE PHOTO BOOK, it could only be ordered in the same size. The new FotoInsight Designer can now convert CEWE PHOTO BOOK layouts from one size into another of the same shape. For example, from a square Photo Book XL in size 12" x 12" (30 x 30 cm), users can now get a smaller square size 8" x 8" (20 x 20 cm) or a larger square size 16" x 16" (40 x 40 cm), adjusted automatically based on the original layout. The same can be done to photo books in portrait or panorama format. The photo book editor in the new FotoInsight Designer software upgrade now saves (caches) changes automatically, so that progress made can't get lost during the design process. That is important, as photo books are getting ever larger and bigger. The upgrade features the large CEWE PHOTO BOOK XXL Panorama (42 x 30 cm) with a padded cover in real leather. For a stronger bind the large panorama pages are specially folded into the cover bind. The software upgrade will be shown at Photokina and will be launched as a free download from October 2010. Its Layout Assistant has been improved and can now recognise faces. That way the automatic layout assistant can now avoid covering faces on photographs. Users will also be able to create custom CEWE PHOTO BOOK Layout-Styles, for the Assistant to use when creating automatic photo book layouts. For demanding photographers wanting to create large calendars FotoInsight is now adding the size A3 photo calendar also in panorama format. Photo calendars on real photographic paper can also be designed in FotoInsight Designer v.4.6. Real photographic paper developed in a professional photo lab guarantees brilliant colours and superior durability. The colour schemes of the application's calendar templates received a make-over and the application can now also display bank holidays in photo calendars. The software upgrade also features the option to choose the pages in spiral-bound photo cover note pads (A5 and A4) with the option of lined or graph paper. In general FotoInsight is increasing the user's choice. For example it is now possible to give each greeting card in a set of greeting cards an individual design. The Managing Director of FotoInsight Klaas Brumann comments: "The new photo calendars on photographic paper and the new CEWE PHOTO BOOK XXL Panorama provide an impressive environment to preserve the favourite pictures from holidays and events in shiny quality. Books can be accessed at any time. Unlike videos and images on digital media there will never be compatibility problems with future digital standards. With your FotoInsight Photo Book simply turn the pages and enjoy, now and in a hundred years."